Kansas City, Mo. 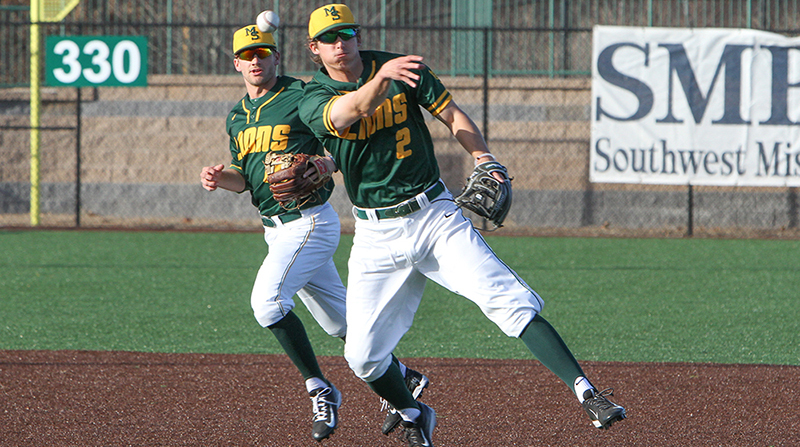 — The Missouri Southern baseball program has been picked to finish fourth in the MIAA Preseason Coaches Poll, the league announced today. The Lions were 32-20 last season and finished in fifth place in the final MIAA standings. Southern returns a pair of All-MIAA performers in second-teamer Richie Gorski and third teamer Tyler Sutherland. In all Southern returns five starters in the field and two on the mound to join a group of talented newcomers incoming for the Lions this year. Gorski and Sutherland join Danny Biggs, Trever Burkdoll and Brett Graham as position starters as Zach Litchen and Sean Goostree return from the starting rotation. Walker Whitworth and Cory Canterbury should see considerable time in the outfield and Lincoln transfer Mike Million, as well as Jordan Moon will be looked at for depth in the outfield. Around the horn, either Colin Chandler, Garan Stevens or Joe Kinder can see time at third, while Gorski and Burkdoll will patrol shortstop. Arkansas transfer Max Hogan and junior college transfer Alec Alvarez will vie for time at second. Graham, Todd Hinkley and Joe Paulino could see time at first, while junior college transfer Dave Prost will lead a trio of catchers that will also see Paulino and Alex Wheeler see time. Litchen and Goostree are the returning starting pitchers that will see help from Division I (UT-Arlington) transfer Dan Hawk, as well as junior college transfer Seth Mesey. Matt Harvey, Austyn Gooch, Craig Larkin and Trenton Moeller all return to shore up the bullpen that will see help from transfers Christian Goshen, Will Bausinger, Gatlin Watson, Brandon Saddler, Hayden Brauser, and Eric Wilkinson. Central Missouri was picked to defend its league title and received nine of the 13 first-place votes. Emporia State was picked second and got one first-place vote, while Missouri Western was third with two first-place nods. Southern was fourth, followed by Washburn with the other first-place vote. Central Oklahoma was sixth, followed by Northeastern State, Pittsburg State, Northwest Missouri, Nebraska-Kearney, Lindenwood, Fort Hays State and Southwest Baptist to round out the poll. The Lions will open up the 2017 season with a pair of games on the road as Southern travels to Memphis to take on Christian Brothers University on Feb. 7-8.